Ho Chi Minh, 15 Apr 2015– Panasonic Gran-Forum 2015 opens today at the GEM Exhibition Center in Ho Chi Minh City to demonstrate the company’s full array of innovative products and integrated solutions designed to meet the needs of Vietnamese households and businesses. This is the first large scale business-to-customer (B2C) and business-to-business (B2B) convention organized by Panasonic Vietnam. Panasonic Gran-Forum 2015 will run for two consecutive days (15-16 April). (1) Panasonic Demo Corner enables visitors to experience B2C products and B2B solutions first hand. Products for homes such as Panasonic Cooking appliances which facilitate food preparation, side-by-side refrigerators, and washing machines which boosts washing performance with the new Active Foam System and Dual Wave Pulsato are able to remove stains within three minutes, are showcased. Also on display are visual and display solutions for offices – 4K television with Master Color Studio technology, 4K camera, PBX, and high definition video conference system. Panasonic air conditioners with energy efficient ECONAVI sensor technology and Flexi System VRF highlight superior cooling performance for both residential and commercial buildings respectively. At the Panasonic Demo Corner, visitors will also see professional devices such as electric breakers, wiring solutions, lighting and security equipment. 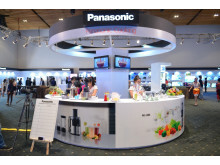 (2) Panasonic’s Daily Solutions corner is designed to highlight how Panasonic products and solutions can meet diverse needs, from homes to offices as well as convenience stores to restaurants, 24 hours a day. Successful regional and global projects serve as relevant case studies which could be replicated in the Vietnam market towards fulfilling a better life, a better world in a variety of spaces – homes, offices, retail, business, travel and automotive. UNESCO Strategic Partnership: Since 1995, Panasonic has joined hands with UNESCO annually to communicate the importance of preserving our World Heritage Sites by “promoting next generation environment education activities”. TOKYO SKYTREE LED Project: Panasonic is the sole supplier of LED lighting for the Tokyo SKYTREE, the world’s tallest free standing broadcast structure at 634 meters. 1,995 Panasonic LED lights, combined with advanced lighting control systems to create spectacular effects for visitors. Panasonic LED lights contribute to lower carbon emissions, thereby minimizing environmental impact. Olympic Worldwide Partnership: Panasonic has renewed its Official Worldwide Olympic Partnership agreement for eight more years through to the 2024 Olympic Game. Panasonic provides the Olympic Game with a variety of solutions, including TVs, audio visual systems, broadcast equipment for professional use, navigation systems and video surveillance products. The company will also provide technical support to ensure smooth operation of the Game. Fujisawa Smart and Sustainable Town: Fujisawa SST is an eco and smart town that places high priority on residents’ lifestyle. As one of the town’s developers, Panasonic provides energy management, housing, security and mobility solutions for residents. Fujisawa SST serves as a successful case study for developing nations like Vietnam. As Vietnam’s infrastructure grows, sustainable solutions are important in order to effectively support the increasing number of urban residents. Made in Japan – Japan Quality: “Made in Japan” products demonstrate Japan’s high quality and advanced technology which Panasonic will continue to uphold for its Vietnamese customers and business partners. In April 2015, Panasonic announced the Panasonic Business Brands across five major business fields, consumer electronics, homes & living, automotive, B2B solutions and devices. Panasonic Vietnam Group aims to be a one-stop solutions company for both B2C and B2B in the country. Panasonic Vietnam (PV) is the first 100% foreign invested company to assume the role of the country headquarters in Vietnam. Up to now, Panasonic Vietnam Group comprises of seven companies, five of which are manufacturing companies – Panasonic Industrial Devices Vietnam (PIDVN), Panasonic System Networks Vietnam (PSNV), Panasonic Appliances Vietnam (PAPVN), Panasonic AVC Networks Vietnam (PAVCV) and Panasonic Eco Solutions Vietnam, and the Panasonic Research & Development Center Vietnam (PRDCV). The Group currently employs a total workforce of about 8,500 people. In Vietnam, Panasonic is one among those enterprises that place great emphasis on social activities surrounding education and environment.